Boone Central overcame a sluggish opening with a furious finish Friday, defeating Grand Island Central Catholic 56-43 for the C1-4 District championship before a packed house at Central City High School. 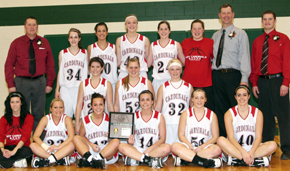 The Cardinals added the 2009-10 C1-4 title hardware to last year’s C1-5 District crown and will compete in the Nebraska Girls State Championship Basketball Tournament for the second consecutive season, beginning Thursday. The Cardinals will shoot for that initial state tourney triumph in the opening game of Class C1’s first round Thursday, March 4. Boone Central (20-3), seeded #8, will face #1 seed Lutheran High NE (23-0) of Norfolk at Pershing Auditorium in Lincoln (9 a.m.). To earn their second straight trip to the Capital City and a shot at the #1 Eagles, it took a gritty Cardinal effort against an athletic G.I.C.C. (13-9) squad that took Boone Central out of its comfort zone early. “We were playing a team we were unfamiliar with and it took a while to adjust to their athleticism, but our defense got better and better as the game progressed and we were able to make some nice runs on them,” Kennedy commented. In the fourth quarter, Boone Central parlayed its superior depth and defense and G.I.C.C. foul trouble into a final run to the championship. Carder rained in another 3-pointer on the opening possession of the period and closed an 11-3 Cardinal streak with her fourth trey of the game. Trying to scratch and claw back into the contest, the Crusaders lost three players to fouls while Boone Central sank 8-of-15 free throws. “G.I.C.C. was determined to defend the inside portion of our offense and force us to make outside shots,” Kennedy noted. “We shot the ball with confidence from the perimeter and answered every run they made. “Erica made some huge shots in the second half and we got great contributions from all 12 players. Boone Central finished 13-of-33 from the field, including 8-of-21 from 3-point range. The Cardinals shot a staggering 40 free throws, connecting on 22. The Cardinals limited G.I.C.C. to 16-of-50 from the field, just 4-of-24 beyond the arc. The Crusaders made 7-of-12 foul shots. Boone Central outrebounded Central Catholic 35-24 and both teams committed 17 turnovers. Kennedy led Cardinal scoring with 14 points. 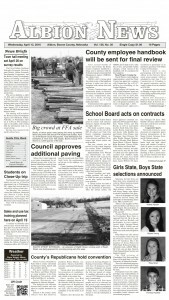 Carder tallied 12, Beckwith nine and Struebing seven. Carder also led Boone Central rebounders with six. Kennedy dished out five assists and Beckwith made four of BC’s nine steals.